Whether it's in haze-shrouded cities, plumes of car exhaust or even clear skies, fine particle pollution can be found just about everywhere in the United States. These pollutants are so small they can slip inside buildings and penetrate deep into lung tissue. On hot summer days, high concentrations of the pollutant help trigger poor air quality alerts, warning the very young, elderly and sick to stay indoors. Exposure to fine particles is linked to premature death and higher risks of asthma and heart attacks. After decades of increasingly strong assertions that there is no known safe level of fine particle exposure for the American public, EPA under the Trump administration is now considering taking a new position. The agency is floating the idea of changing its rulemaking process and setting a threshold level of fine particles that it would consider safe. The change would affect how EPA counts the health benefits of reducing fine particles when crafting rules aimed at reducing other pollutants, like greenhouse gases. If the plan moves forward, it could have implications for how well EPA's regulations protect human health. The Trump administration introduced the idea in the fall of 2017, when it publicly released a proposal for repealing the Clean Power Plan, an Obama-era rule to cut greenhouse gas emissions from power plants. While the rule wasn't focused on fine particles, it would have reduced them anyway by requiring plant operators to install new technology to cut CO2 emissions. The authors of the rule had counted the health benefits from reducing particles in their justification for why the benefits of regulating greenhouse gases outweighed the costs of implementing it. The health benefits of cutting CO2 become even more evident when paired with the "co-benefits" of cutting fine particles. This process of weighing the economic pluses and minuses of any particular rule is known, in EPA lingo, as a cost-benefit analysis. It's a key factor in determining whether a rule makes sense both in terms of its environmental and health benefits and in the costs it imposes on industry. Critics see EPA's latest proposal on particulates as a way to undermine efforts to establish strict controls on greenhouse gas emissions from power plants, by making the benefits of regulating them seem significantly lower. "It would be hard for the Trump administration to say [the Clean Power Plan] is a net bad for the American people; the total benefits were significantly more than the cost," said Richard Revesz, director of the Institute for Policy Integrity at New York University. Revesz noted that Trump's EPA was only able to legally justify rolling back the rule by "mangling" the Clean Power Plan's direct greenhouse gas benefits and its additional co-benefits of cutting pollutants like fine particles. Roughly half of the estimated benefits from reducing greenhouse gases at power plants comes from the accompanying reductions of fine particles. The Obama administration estimated that the Clean Power Plan would have $20 billion in climate benefits and an added $13 billion to $30.3 billion in benefits from reductions in particulates. EPA is considering changes to its cost-benefit analysis, even as researchers studying fine particles warn that federal regulations already fail to fully protect the public from the pollutants' effects on human health. Fine particles, or particulate matter, get their shorthand name, PM 2.5, from their size. Measuring in at a minuscule 2.5 micrometers, these particles are a tiny fraction of the width of a human hair. They can come from sources like power plants and automobiles, and from smaller sources like fireplaces and cigarette smoke. Fine particles can also form from other pollution sources in the atmosphere through a chemical reaction. They're everywhere. Because of their ability to travel deep into the lungs, a number of its effects are linked to the cardiovascular system. The pollutants have been found to enter the bloodstream. Health studies have also drawn connections between fetal exposure and low birth weight, and increased risk of lung cancer, according to the Centers for Disease Control and Prevention. 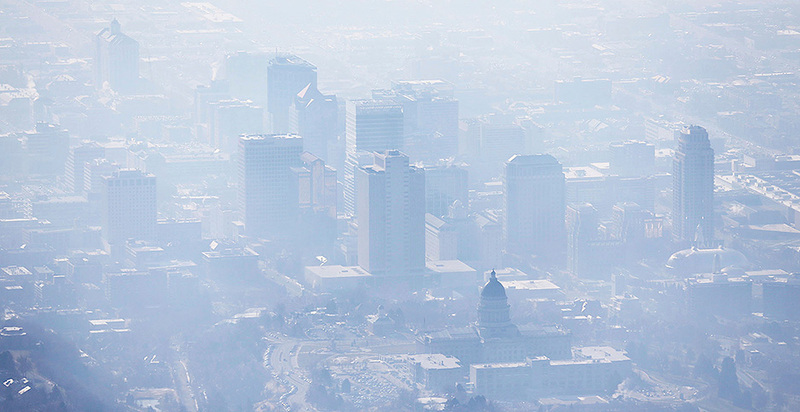 "The PM 2.5 index is most strongly associated with health effects than any other," said C. Arden Pope, an economics professor at Brigham Young University. He is one of the researchers involved in the landmark studies of the pollutant called the "Harvard Six Cities" and the American Cancer Society study. Both outlined the connections between human health and exposure to fine particles. Pope describes the relationship between fine particle exposure and its harm on people as linear. Like lead or cancer-causing compounds, there is no known safe level of exposure. In other words, PM 2.5 is not a "threshold pollutant," meaning there is no level below which no risk exists. It's this fact that has Pope and other experts concerned about the EPA proposal on particulates buried in the proposed repeal of the Clean Power Plan. To reset that threshold, the agency turned to another air regulation, the National Ambient Air Quality Standards. This nationwide standard limits emissions of particle pollutants to within an "adequate margin of safety." Currently, that standard is set at an annual average concentration of 12 micrograms per cubic meter. In its proposal, EPA suggested it would assume there were no health benefits in cutting fine particle pollution below the levels set in the NAAQS. Such an approach would leave out the very lowest concentrations of fine particle exposure. It's still unclear whether the particle proposal will make it into the final replacement for the Clean Power Plan. A draft notice is still under White House review and could become public in the coming weeks. Because the benefits of cutting fine particles, to health and the economy, are included in a variety of federal rules, the implications of altering those values could extend beyond the Clean Power Plan. Pope said it was "absurd" for EPA to make the argument that there was no benefit to reducing fine particles below the current national standard set by NAAQS. "There is no evidence there is anything magical in 12 micrograms," said Pope. Similarly, EPA's proposal to not count fine particles below the "lowest measured level," or LML in epidemiological studies, also raised concerns about not fully accounting for health risk. (The lowest measured level EPA took comment on in its repeal proposal was between 8 or 5.8 micrograms per cubic meter.) Just as EPA is assuming adequate health protections from controls of fine particles set by NAAQS, in this approach it's assuming that any concentration of NAAQS that hasn't been tested in health studies carries no risk. Using LML instead of NAAQS would mean that EPA counts more benefits of cutting fine particles but still suggests that some exposure for the American public is OK.
"LML is just a better arbitrary threshold than the NAAQS," said John Bachmann, former associate director for science, policy and new programs in EPA's Office of Air Quality Planning and Standards. Bachmann pointed out that recent research using Medicare data found there was an increased risk of premature death from fine particle exposure at less than half the concentrations controlled by NAAQS. That 2017 study relied on data from 60 million Medicare recipients nationwide. The EPA proposal on fine particles is supported by industry representatives like Robert Kappelmann, an energy and environmental consultant working for the Florida Municipal Electric Association. Kappelmann and other critics of the Clean Power Plan argue that EPA is "double-counting" health benefits already accounted for under NAAQS, which requires states to craft their own plans to control particulate pollution. He noted that most places in the country are already compliant with NAAQS standards. Kappelmann pointed to EPA's standard for fine particulate matter, stating EPA had established 12 micrograms to be within a "margin of safety." That means either EPA's value is wrong or particulate levels below that are safe enough for human exposure, he said. "Something is out of whack there. We think that's inappropriate," Kappelmann said of the Clean Power Plan's original co-benefit analysis. Other groups, like the Utility Air Regulatory Group, have raised similar concerns in public comments to EPA. The group noted that EPA's own modeling from 2016 predicted that just 5 percent of the population would be exposed to particle levels that reach 12 micrograms per cubic meter. Most of the predicted benefits of the Clean Power Plan would come from reducing fine particles below that level, the group said. "Because, as discussed above, NAAQS are set at the level EPA has determined is protective of public health, it is improper to claim benefits below that level," the group wrote. But former EPA officials noted that when the agency talked about bringing fine particle levels down to within a "margin of safety," officials weren't saying that level of exposure was without risk. "That doesn't mean zero pollution — there's a judgment for the administrator to make each time the NAAQS are reviewed, looking at the newest science, weighing public health protection against the certainty of scientific information," said Janet McCabe, former acting assistant administrator of EPA. She argued that the Trump administration's main target is the "underpinnings" of public health protections. Bachmann, the former EPA official, also rejected the idea that EPA was double-counting benefits. Factoring in the co-benefits of other regulations is a regular part of drafting rulemaking, he said. Besides, he added, the Clean Power Plan was looking at benefits of fine particle reductions below the levels controlled under NAAQS. "Most of the things we regulate, it's hard to quantify the benefits, so we quantify what we can," said Bachmann. In this case, it was cutting particulate pollution. If EPA does go forward with its proposal on particles, it could have ripple effects on other federal rules. In a recent working paper in the Minnesota Law Review, NYU's Revesz and co-author Kimberly Castle said that if the proposed changes are finalized, the ensuing court challenges could have "far-reaching consequences" for climate and other public health rules. That's because the co-benefits of particulate reductions below 12 micrograms are widely used in regulations on emissions from stationary sources. In addition to the Clean Power Plan, the value of reducing fine particles plays a major role in backing up the Mercury and Air Toxics Standards. The Obama administration estimated that reducing mercury and toxics would save between $4 million and $6 million, while a whopping $37 billion to $90 billion would come from the byproduct of lessening particle pollution. Revesz said it's hard to imagine the courts would accept any attempt by EPA to undo its use of co-benefits. That would deviate from standard practice at the agency. He and Castle slammed the Trump administration's proposed changes. "The Administration, and other regulation opponents, suggest theirs is a logical way to account for effects, arguing that including these benefits artificially inflates the positive effects of regulating. But what they advocate is a dishonest attempt to obscure the actual effects of regulations from the public," they wrote.